During the 1830s New York City was in dire need of a fresh water supply to combat the steady rise of disease and to fight numerous fires that often engulfed large tracts of businesses and homes. After numerous proposals and an abandoned plan two years into its production, construction of an unprecedented magnitude began in 1837 under the expertise of John Bloomfield Jervis. The proposed plan called for a 41-mile aqueduct and dam to be built in order to run water from the Croton River to New York City. Three to four thousand workers, mostly Irish immigrants earning up to $1.00 per day, completed the masonry marvel in just five years. In 1842 water flowed into above-ground reservoirs located at the present sites of the New York Public Library and the Great Lawn of Central Park. Throngs of people attended the formal celebration held on October 14th and celebrated with “Croton cocktails” – a mix of Croton water and lemonade. This 19th-century architectural achievement cost New York City approximately 13 million dollars and was believed able to provide New Yorkers with fresh water for centuries to come. The population spiraled upward at a dizzying rate, however, and the Croton Aqueduct, which was capable of carrying 100 million gallons per day, could no longer meet New York City’s needs by the early 1880s. Construction of the New Croton Aqueduct began in 1885 and water began to flow by 1890. Although no longer the sole supplier of fresh water, the Old Croton Aqueduct continued to provide water to New York City until 1965. In 1968, the New York State Office of Parks, Recreation and Historic Preservation purchased 26.2 miles of the original 41-mile aqueduct from New York City. Presently, Old Croton Aqueduct State Historic Park is a linear park which runs from Van Cortlandt Park at the Bronx County/City of Yonkers border to the Croton Dam in Cortlandt. In 1987 a section was reopened to supply the Town of Ossining and in 1992 the Old Croton Aqueduct was awarded National Historic Landmark Status. The scenic path over the underground aqueduct winds through urban centers and small communities. It passes near numerous historic sites, preserves, a museum highlighting the construction of the Aqueduct, and many homes. The Aqueduct’s grassy ceiling provides abundant recreational opportunities for outdoor enthusiasts. 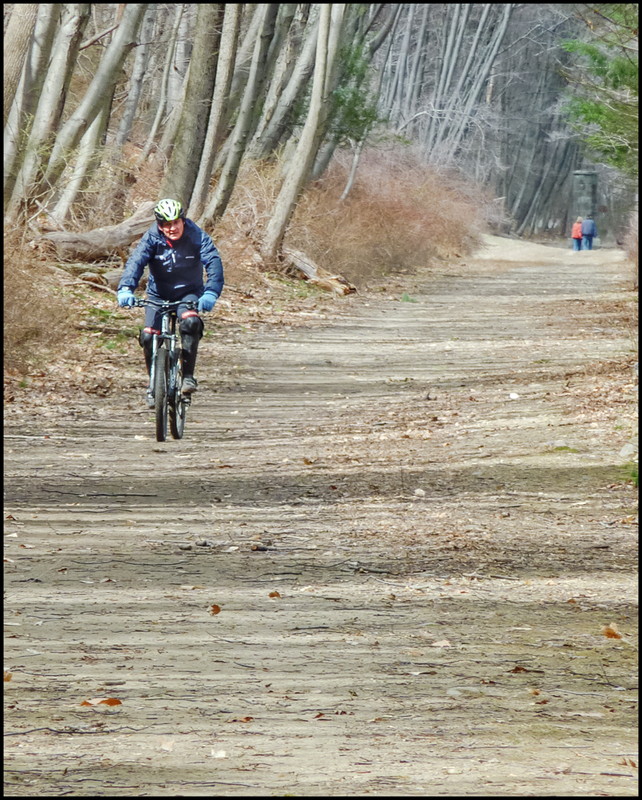 While primarily for walking and running, parts of the trail are suitable for horseback riding, biking (except during “mud season”), bird watching, snowshoeing, and cross-country skiing. Taken back in March, 2011 with a Panasonic Lumix ZS3. This entry was posted in Landscapes, People. Bookmark the permalink.